Duke opens as heavy favorite in NCAA tournament odds: Who are the best bets? If filling out a bracket doesn’t quite cut it for your March fix, futures odds are out for the NCAA tournament. And to the surprise of nobody, Duke’s run to the ACC tournament championship with a healthy, dominant Zion Williamson has the Blue Devils listed as a heavy favorite to cut down the nets in Minneapolis. As off the time of this post, Duke was a 9/4 favorite, according to Sportsbook.ag. Trailing the Blue Devils are the rest of the No. 1 seeds Gonzaga (5/1), North Carolina (6/1) and Virginia (15/2). Kentucky is the favorite among the No. 2 seeds, but marks a dramatic increase in odds from the top seeds at 14/1. Michigan St. (15/1), Tennessee (16/1) and Michigan (18/1) fill out the next tier of favorites beyond the top seeds. With those odds, the Wildcats could present the one of the better betting opportunities of the tournament. 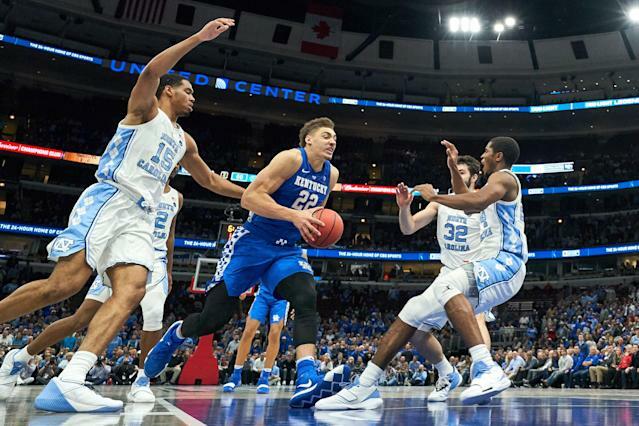 Less-talented Houston and Iowa St. teams are the biggest threats in their half of the Midwest region, while a North Carolina team that Kentucky beat soundly in December stands in its way as a potential regional final matchup. Granted, the Tar Heels have improved dramatically since that game. But Kentucky’s paying twice as much as Carolina in Vegas. A Tennessee team that was once ranked No. 1 in the country could be an attractive choice at 16/1 for those non-believers of Virginia, the top seed in the South region that Tennessee shares. Looking deeper into the odds shows a Virginia Tech team buried under 80/1 odds as a No. 4 seed. The Hokies are expected to have star guard Justin Robinson back for the tournament after a 12-game absence and are fresh off a 12-6 run in the ACC that saw them lose four of those games without him. The reason their odds are so long is an anticipated Sweet 16 matchup with Duke, a substantial obstacle to any championship hopes. Virginia Tech beat Duke this season, but did so while Zion Williamson was in street clothes. Robinson was also sidelined for that game. The longest of odds belong to a First Four team in No. 16 seed N.C. Central. If they get past North Dakota State in the play-in round, the Eagles reward will be a matchup with Duke. What do those prospects earn the Eagles? Odds of 9,999/1. The rest of the No. 16 seeds also have ridiculously long odds, but they’re substantially better than N.C. Central’s at 5,000/1. All of the updated odds can be found here.